Norway is well known for its mountains, fjord coastline, sea-faring history, unique coastal life, midnight sunlight during summer, and brilliant Winter Olympics performance. It’s also a popular choice for international study, offering a good selection of universities, including four entries in the QS World University Rankings® 2019. Norway is also renowned for its contributions to art and culture – it is, after all, the homeland of hugely influential figures such as playwright Henrik Ibsen and painter Edvard Munch, creator of The Scream, one of the most recognizable paintings in the world. Another major driver of tourism to Norway is the stunning Arctic Circle phenomena known as the northern lights. If all that appeals but you’re worried about losing a digit in the freezing cold, worry no more. The warm Gulf Stream means Norway isn’t actually as cold as you might imagine. Coastal areas are relatively mild and average winter temperatures rarely dip below -4oC (24.8oF) in the capital city Oslo, so one can venture around fairly comfortably (in layers, yes, but without turning blue). If you’re keen to study in Norway, click on the tabs below to find out about top Norwegian universities, popular student cities, and how to get started with your application. 99 percent of Norway’s electricity comes from hydropower. Higher education in Norway is comprised of a mixture of both public and private universities. Some are specialized, some comprehensive, and some – known as “university colleges” – concentrate mainly on providing undergraduate-level education in a range of more vocationally focused subjects. Four universities in Norway feature in the QS World University Rankings® 2019, all large public universities. These are the University of Oslo (ranked 135th in the world), University of Bergen (171st), Norwegian University of Science and Technology (joint 363rd) and University of Tromsø The Arctic University of Norway (joint 369th). Norway is signed up to the Bologna Process, which aims to make European higher education systems more compatible. The Bologna Process includes the European Credit Transfer and Accumulation System (ECTS) which means students who complete degrees or courses at universities in Norway will hold certifications that are recognized by other countries worldwide. Bachelor’s degrees at universities in Norway take three years to complete, master’s degrees take two years and PhD degrees a further three years. You can also opt for a one-tier master’s degree which allows you to combine your bachelor’s and master’s in a single continuous program lasting five years – this is often offered for architecture, business management, engineering, dentistry and law programs. While you study in Norway, you can also choose a traditionally Scandinavian professionally orientated program, which is exempt from the Bologna system and includes six years of study and subjects such as Candidate of Medicine (cand.med), Candidate of Veterinary Medicine (cand.vet.med), Candidate of Psychology (cand.psychol) and Candidate of Theology (cand.theol). If you’d like to study in Norway in English, you can choose from more than 200 master’s programs taught in English, and many English-taught undergraduate programs. For example, English language programs offered at the University of Oslo include subjects in humanities, social sciences, law, theology, mathematics and natural sciences, education, medicine, dentistry, energy, development, gender studies and “Norwegian for Academics” which requires no previous knowledge of the Norwegian language. Due to its fast-growing immigrant population, Oslo is known as the melting pot of Norway, with continuous influxes of people from all over the world (the largest groups coming from Sweden, Poland and Pakistan). The resulting cultural and ethnic diversity means there’s no end to variety in Oslo’s cuisines, arts and shopping experiences. Full of life and culture, Oslo’s city center is easy to travel around on foot, and offers a good selection of museums, galleries, cafés, music venues, festivals and nightlife, as well as being home to some of Norway’s wealthiest celebrities. It’s also easy to access the great outdoors from Oslo – popular pastimes include hiking, fresh-water swimming (just don’t swim in Maridalsvannet lake – it provides drinking water for the city) watersports, cross-country skiing, ice-skating and cycling. 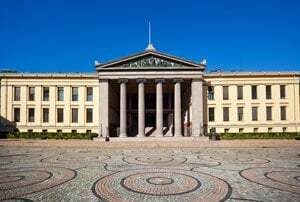 The University of Oslo is the highest-ranked university in Norway, at 135th in the QS World University Rankings 2019. Also of note among universities in Oslo are BI Norwegian Business School, Oslo University College (which offers many courses in English including the European Project Semester), the Norwegian School of Sports Sciences, the Oslo School of Architecture, the Norwegian Academy of Music and the Norwegian University of Life Sciences. Norway’s second-largest city, Bergen is located on the west coast, and is a popular base for visitors exploring the country’s famous fjords – long, narrow stretches of water bordered by steep cliffs (this might not sound much, but they really are spectacular). The city is surrounded by mountains, earning it the nickname the City of Seven Mountains, which makes it perfect for hiking in summer and skiing or sledging in winter. As well as being the Gateway to the Fjords, Bergen is an attractive coastal city, with its historic harbor area, Bryggen, included on the UNESCO World Heritage list. Hanging out at the beach is a popular summer activity, with clean, fresh and comparatively warm waters and plenty of sandy beaches. Bergen is home to the third-largest and second highest-ranked university in Norway: the University of Bergen, 171st in the QS World University Rankings 2019. Other universities in Bergen include Bergen University College, the Norwegian Institute of Marine Research and the Norwegian School of Economics, one of Norway’s leading business schools. If you’re really looking for a study destination with a difference, Tromsø could well be for you. 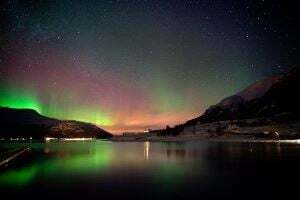 This relatively small city is mainly located on the island of Tromsøya, close to the northern tip of Norway, and well within the Arctic Circle – which puts it in prime position for those wishing to view the famous aurora borealis (northern lights) in all its glory. Promoted as the capital of the Arctic, Tromsø is a popular base for those exploring this region and there are plenty of fjords and mountains nearby (bored of all this natural beauty yet?). It’s also in the northernmost part of Norway, meaning it gets the midnight sun during the summer months. The city is also home to the world’s northernmost university, Tromsø University, which was ranked joint 369th in the 2019 QS rankings. While there aren’t many universities in Tromsø, it does have plenty of research institutions and a highly skilled population. Tromsø is also where the indigenous Sámi population and culture are most visible. In terms of universities in Trondheim, the city is dominated by the Norwegian University of Science and Technology (NTNU), which is ranked joint 363rd in the QS World University Rankings 2019. Sør-Trøndelag University College is also based in Trondheim, with other technology-orientated institutions including the SINTEF and St Olav’s University Hospital. NTNU has around 39,700 students – equal to around 21% city’s 187,353 inhabitants. The city is therefore heavily influenced by student culture, at the heart of which is the large Studentersamfundet i Trondhjem, the student society building where concerts, political debates, wine tasting, discussions, discos, football matches, choirs and orchestras are regularly hosted. As you might expect, Trondheim also has a vibrant nightlife, with many pubs and bars open all week and all night. Previously important as a military stronghold, Kristiansand is now known as the business capital of southern Norway, and has a large urban area populated by factories (nickel, ice-cream and beer and soft drinks), a refining plant, shipbuilding and repair facilities, and an industrial area known as the Korsvik. It’s also an important transport and communications node, connected to continental Europe by air, sea and rail. Despite this, you’ll never be far from a forest in Kristiansand, with popular activities including swimming, fishing, sailing, golfing and enjoying the archipelago near the city called Skjærgården, or Markens Gate, a mainly pedestrianized shopping street. The University of Adger (UiA) is just east of the town center and relocated from its old military camp campus into a new building in 2001. UiA teaches many subjects, but only a few are taught in English, despite most of Kristiansand’s citizens being fluent English speakers. Other universities in Kristiansand include the Noroff University College, music education at Musikkens hus (House of Music) and several small, private higher education schools including a Christian journalism school and the regional branch of BI Norwegian Business School. Students from other Nordic nations who intend to study in Norway are entitled to access the Norwegian National Insurance Scheme if they are registered in the National Population Register in Norway. If you are not a member, you are still entitled to healthcare in Norway under the National Insurance Act, without needing a European Health Insurance Card. Students from countries within the EEA and from Switzerland should apply for a free European Health Insurance Card (EHIC) from their country of origin. If you are not entitled to one, you’ll need to purchase private medical insurance. Students from outside the EEA are also eligible to access healthcare in Norway under the National Insurance Scheme. If your course is longer than a year, you should automatically be registered; if your course is between three and 12 months, you’ll need to apply for membership via your local insurance office. If you do not become a member of the National Insurance Scheme, you must have social security coverage or other valid health insurance from your home country. If in doubt, seek guidance from your university’s student support services. Don’t forget, also, that your student card may entitle you to free medical treatment from your institution’s student health services.